Behold a passage from the letter I received from Borders today. It scares me to death as I feel that some day books may be lost to us forever. Technology is not always a good thing. Not when people won’t support the turn of a page, nor the scent of the paper. Previous Post Vol de Nuit by Antoine de St. Exupery. And Guerlain. Oh, I couldn't agree more. I always liked Borders too – more than B&N – and what saddens me most is that this was a result of those e-readers. I have one, as we've talked about, but I would give it up in a second. I think that now when I use it I'll almost feel like it's been forced on me.I do understand that this change is inevitable, but I don't have to like it! I think Borders closing is such a sad thing. Our local Borders stores closed in April, all 3 of them. I wrote an "Ode to Borders" then and here's the link to it:http://myrandomactsofreading.blogspot.com/2011/04/ode-to-borders.htmlWhile I don't feel that the changes in publishing, e-books, online sales and all that are the total reason this chain failed, I do think that these things had something to do with it. I mourn the death of any bookstore. I fear that there is much more to come and I also fear that our libraries are in great peril. This is not a good sign for the future of the book. We're in for an interesting couple of years as far as the publishing industry is concerned. I'm trying to stay positive about this, although it's difficult. The Internet does give us a way to share our love of books in a way we never could before. And there is so much interest in some great, small publishing houses, like Europa and Persephone. So I guess we have to take the good with the bad. I live in Europe so I've never been to a Borders store, I can imagine how sad you must feel about this though. I feel sad about it. Bookstores should never be forced to close down. I do hope the rest of the big stores will be able to stay alive. I am so worried about what the Borders closing may presage for the future of the paper book. I'm just not a e-book reader and never will be. I'm also mega-bummed because after killing off all the local independents, Borders was the only bookstore (other than a handful of second hand and comic book stores) within a close distance. I've got all my fingers crossed that another bookstore will go in, especially seeing as (according to the local paper) the local Borders was consistently among their top 10 performers. I began my book career at Borders in Texas and that store was always dear to me, in spite of my move back to Nebraska and to Barnes and Noble. I'm very saddened about the demise of any bookstore, but this one is especially heartbreaking. It is more than sad, it's tragic. I am very worried about a world without books as we know it, too. I couldn't imagine everything being electronic. That would be so sad! What a sad thing to see… sign of the time. I'm afraid the only national chain here in Canada, Chapters, may not survive long. But of course I do wish they will. I'm still a very traditional reader, love to hold and turn the paper pages. BTW, I've just posted a review of A Moveable Feast, tying it in with bits of "Midnight In Paris"… although I know you're not a fan of that film. But, just for fun, in lieu of going to Paris. I think it's sad to see any such store close, but I don't think it means the end of paper books either. There are other stores that are going strong and there are libraries and other places to get books. Although I love paper books too, I also don't think that eReaders and digital books are such a bad thing either. I can have a lot more books on my Nook Color than I could ever carry around with me. Amazon just released a renting option for some textbooks through their Kindle apps. Although none of my books are available this semester, I think that's a great option too especially considering the cost of college textbooks. Of course, there are some textbooks I want to keep for future reference that relate to my major, but there are many that I don't need past the semester I'm taking the class, so an e-option would be great… plus, save a lot of weight off my backpack! Personally, I hardly ever went to Borders because they weren't readily available where I've lived. However, there are other bookstores that I frequent. I would hate to see some of them close. However, I don't think it means the end of paper books at all. It may mean the end of an era, especially since Borders has been in business for 40 years. However, it does not mean the end of paper books or the demise of learning from reading. Even if the world does change to all electronic things (which I seriously doubt) in the future, we can still read and learn from books in any format. There wasn't a Borders near us, but I'm still sad. Sad for what it means for books in general. There's nothing like holding a book in my hand and smelling the pages. I agree that technology is not always a good thing. I respect what it's doing in terms of small publishers, but I don't want to say goodbye to paper books. It scares me to think that paper books will soon become a thing of the past. I don't like e-reading and I don't think I'll ever try it. I like to feel the book in my hands, feel the pages as I turn them and highlight something if I like it. it's bad enough that the new generation isn't fond of reading. Between e-readers and internet purchasing, I think the demise of brick and mortar stores was pretty inevitable. But I can't bear to think of a world without paper books. That's just too much. And I can't quite imagine cuddling up with my new grandchild and reading an iPad together. Hmm. I received the same notice and it saddened me. I too worry about the future of books and our libraries. I've enjoyed reading everyone's comments here, and I have to say this:I own two (two?!) Nooks, and I like them both very much. There are definite advantages of having an e-reader such as being able to enlarge the text and going on vacation with 197 books in one thin package.That said, my e-reader(s) will never replace the joy and pleasure I find in a real book. As a teacher who finds the need for teaching cursive writing growing more and more obsolete (why don't I just 'teach' texting with your two thumbs? ), I have grave concerns about a book growing obsolete, too. May that never, ever happen. They certainly did put up a good fight, right to the end. What a sad day. I love borders. It was such a homely feel, curling into a chair looking through their books. I hate e-readers and refuse to get one. I need a physical book in my hands. With all these changes going on I am doing my best to support my local independent book stores and second hand shops. 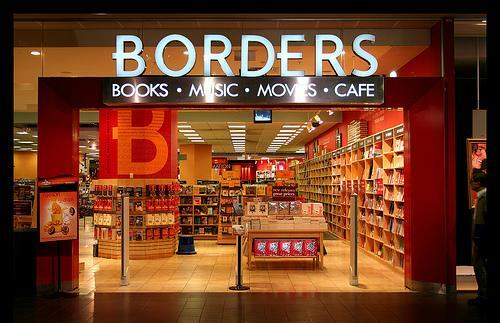 I loved Borders too, but in Australia I don't think their main problem was due to ebooks. The prices were higher than RRP by at least a few dollars. I think poor management and ordering played a part here. I am very sad to see it go, it was handy having a physical bookstore that would be likely to have the book you wanted now and a lovely retreat from the busy world. I don't want to live where there comes an age where paper book no longer exists! I suppose then I will have been long gone. Until then I still like to have a book in my hands now and then even if I have my e-reader with me. I hadn't been a fan of Borders for many years, Bellezza, finding them overpriced (their music and DVDs anyway) and not really all that interesting from a book selection standpoint. However, I know a lot of people don't have access to great bookstores where they live–and it bothers me a bit when ANY bookstore closes. Hope you find a worthy replacement at some point. Richard, you bring up a point that several people have mentioned on this topic: Borders' books were overpriced. Personally, I never felt that way; if I didn't buy something at Costco or Amazon.com at the Used section, they were all expensive. I guess I liked Borders most for the atmosphere, followed by the way they gave special attention and discounts to teachers. And, what worries me most is the decline of the printed word. It's almost as scary as listening to our President give his ideas on how to lead the country, and there's nothing I can do about either dire situation. Bellezza, you don't like Obama's leadership or you don't like how long he's taking to clean up the mess left by eight years of Bush? Not sure I get where you're going with that! P.S. The Borders' high prices I was talking about were non-book related–I think they charged list for books, which seems fair enough to me. I'm so sad about Borders closing. 😦 Don't know what else to say that hasn't already been said. I guess we'll just have to hope that none of the others fall, Marie. Especially the struggling independent stores!